The above shows the extreme negativity in the gold market. You can buy the Canadian Closed-End Fund (CEF) at a 10% to 11% discount to gold (60% of assets) and silver (40%) approximately. Gold and silver have no counter-party risk. Such is the world of closed-end funds. Note the 20% premiums during bull runs! The absurdity of gold stock valuations is illustrated by Kinross. Consistently improving operations with $5.30 book value and with no value attributed to their Russian mine. Net-debt-to-EBITDA of 1.28 with their debt covenants being 3.5xs to 1. Cash of $879 million. 1.14 billion outstanding shares. 27 cents of operating cash flow this quarter share, up 22%. A 2.6 to 2.7 million gold equivalent oz. producer. $698 cash costs and $919 All-in Sustaining Cash Cost. They can survive at $1,000. Below $1,000 operations would be reduced. Of course, Kinross represents a trifecta of hatred: poor past acquisitions (declining stock price), the gold market, and some Russian assets. Basically, the market is heavily discounting their assets because the market is assuming sub-$1,000 gold. No value given to their Russian mine. Miners at or near ALL-TIME (past 90 years) low of stock price to gold price. Part of the reason for the decoupling is the time to find new deposits and place them into production has gone from five to six years out to ten years. Mining costs hve not been kept in check until recently. Past mining managements made poor capital allocation decisions. A mine is a depleting asset! But the market has had four years to replace managements and adjust. 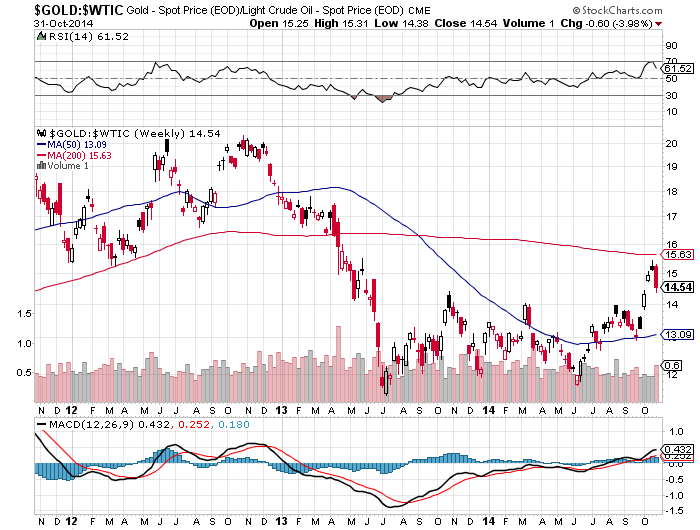 Current sentiment in the gold miners ZERO (0). The recommended allocation is Zero. Contrarians take note but you better have a strong stomach in the near-term. But what you need to focus on is not so much the nominal price but the REAL price of gold. 15% or more of the costs of a mine are energy based. That said, do your own thinking and use this as a case study of where to look for negative sentiment. The question is…..are you being paid enough for the risks? Can gold go to $800? Sure and Kinross and other miners will be closing down many of their operations or even going bankrupt. But consider what $800 gold would mean in a world choking on debt! Perhaps stocks might not hold up in a deflationary bust! It is not just the gold price but the real gold price that matters to miners. However, nominal gold prices in US dollars matter to miners that have debt denominated in US dollars. Just never buy one miner because of the risks to any one company. Use the EXTREME price volatility to your advantage. Don’t buy the stock all at once. If you need to diversify and have limited capital, then SGDM might be a choice–IF you think owning miners is the lowest cost way to participate in either a deflationary bust or inflationary response by the Fed. Otherwise, CEF (above) might be a cheap form of insurance to monetary mayhem. 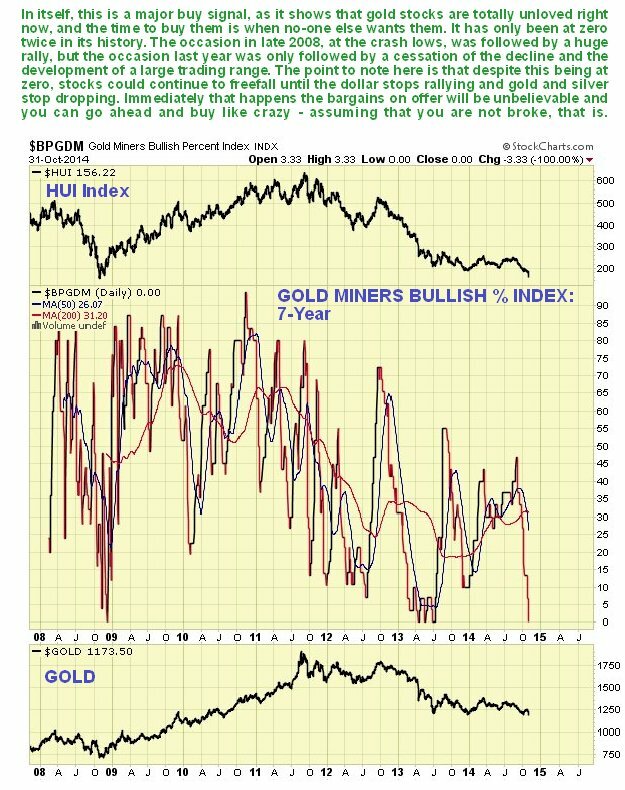 Miners in a capitulation phase–crashing on huge volume–after four year price decline. Folks have had enough. Money managers in forced liquidation? Just remember that you are trying to buy assets at extremely low prices since this is not a franchise. A mine is a DEPLETING asset. How much money goes into a mine versus what is sold discounted by your cost of capital. Obviously, with a cyclical asset you will find losses and the widest spread between price and financial operating metrics because a trough occurs in a bear market of declining product prices. The reverse occurs at the top of a cycle–huge revenues and profits during the boom. So you MUST sell–this is a “burning” match not a franchise. Burn this into your brain. What could go wrong with financial assets? I disagree with Mr. Singer because the bubble in confidence in central planning by the Fed means extreme trends. For example, massive printing of money will cause LOWER gold prices because the market sees perpetual support of financial assets. Why own gold when equities will NEVER drop more than 10% in our lifetimes. Thus, massive monetary intervention is bearish for gold. Of course, house prices could NEVER fall nation-wide and the Internet Bubble ushered in a new normal. Timing is impossible. 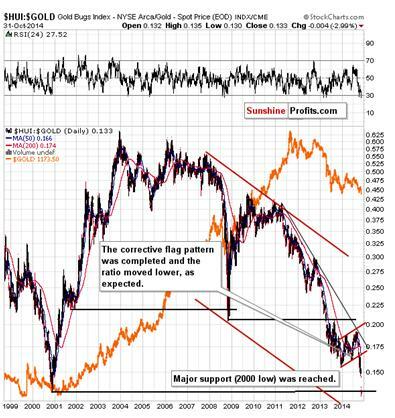 As a result of what happened during just one of the past twenty decades (the 1970s), most people now believe that a large rise in “price inflation” or inflation expectations is needed to bring about a major rally in the gold price. This impression of gold is so ingrained that it has persisted even though the US$ gold price managed to rise by 560% during 2001-2011 in parallel with only small increases in “price inflation” (based on the CPI) and inflation expectations. The reality is that gold tends to perform very well during periods of declining confidence in the financial system, the economy and/or the official money, regardless of whether the decline in confidence is based on expectations of higher “inflation” or something else entirely. Inflation expectations are certainly part of the gold story, but only to the extent that they affect the real interest rate. For example, a 2% rise in inflation expectations would only result in a more bullish backdrop for gold if it were accompanied by a rise of less than 2% in the nominal interest rate. For another example, a 1% decline in inflation expectations would not result in a more bearish backdrop for gold if it were accompanied by a decline of more than 1% in the nominal interest rate. Other parts of the gold story include indicators of economic confidence and financial-market liquidity, such as credit spreads and the yield curve. That large rises in the gold price are NOT primarily driven by increasing fear of “inflation” is evidenced by the fact that the large multi-year gold rallies of 2001-2006 and 2008-2011 began amidst FALLING inflation expectations. These rallies were set in motion by substantial stock market declines and plummeting confidence in central banks, commercial banks and the economy’s prospects. Even during the 1970s, the period when the gold price famously rocketed upward in parallel with increasing fear of “inflation”, the gold rally was mostly about declining real interest rates and declining confidence in both monetary and fiscal governance. After all, if the official plan to address a “price inflation” problem involves fixing prices and distributing “Whip Inflation Now” buttons, and at the same time the central bank and the government are experimenting with Keynesian demand-boosting strategies, then there’s only one way for economic confidence to go, and that’s down. Since mid-2013 there have been a few multi-month periods when it appeared as if economic confidence was turning down, but on each occasion the downturn wasn’t sustained. This is due in no small part to the seemingly unstoppable advance in the stock market. In the minds of many people the stock market and the economy are linked, with a rising stock market supposedly being a sign of future economic strength. This line of thinking is misguided, but regardless of whether it is right or wrong the perception is having a substantial effect on the gold market. For now, the economic confidence engendered to a large extent by the rising stock market is putting irresistible downward pressure on the gold price.